The project addresses the major territorial challenge of the Danube area – the unbalanced distribution of innovation performances between Western part of the region with a high level of development and the Eastern part that is lagging behind. 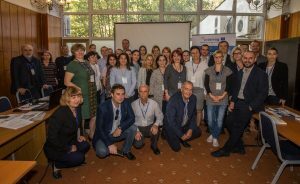 The project aims to leverage the innovation-driven entrepreneurial ecosystem in the Danube area by developing smart and coordinated cluster policies in the context of RIS3, enhance innovation management knowledge and skills and foster transnational cluster cooperation in Agro-Food sector. The project aims to generate a significant change by developing Danube S3 Cluster Strategy and Programme based on Quadruple Helix involvement as transnational strategic documents focused on exploiting the linkages between mutually reinforcing specialization areas across sectors. The strategy will be tested by 5 pilot initiatives in 4 cross-cutting themes (market intelligence, open innovation, business models for circular economy and healthy food) that are interconnected and able to generate new innovative project ideas and feeding into EUSDR. Danube S3 Cluster Programme – transnational coordinated programme for clusters active on Agro-Food in the context of smart specialization. The project will also enhance the innovation management knowledge and skills of cluster managers and cluster members by performing 200 innovation management assessments and organizing 3 joint training sessions with the actors of the Quadruple Helix, with a special focus on SMEs. Finally, an intensified cooperation among clusters and cluster members will be achieved by organizing 2 matchmaking events and setting up the Danube S3 Cluster Transnational Network. The partnership is composed by 15 Project Partners and 5 Associated Strategic Partners from 11 countries in the Danube area.